Cilinaya Dance is one of the Balinese classical dances, created in 1986 by the dance artist Prof. Dr. I Wayan Dibia, SST., MA. 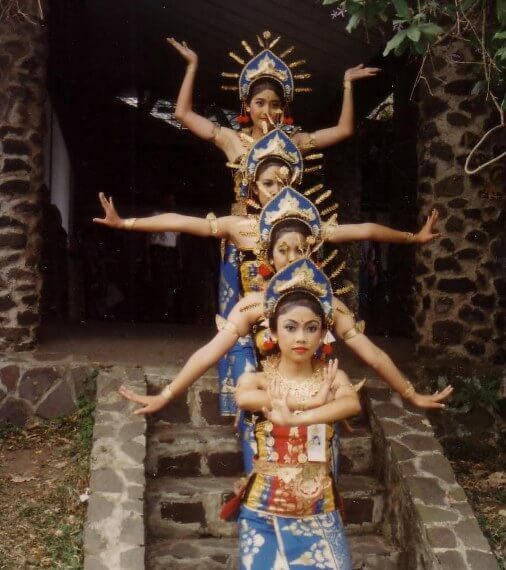 Initially, this dance was created to be performed by Sekaha Gong Patra Kencana Singapadu, Gianyar - Bali. According to the choreography, Cilinaya Dance belongs to the "group-dance", where the whole dance is performed jointly by the dancers. This dance is performed by 4-5 female dancers. The dance performance is started by the movement of two beautiful dancers as an opening act. A few time later other dancers joined the group. This dance is performed with soft and dynamic movements, full of smile and joy. The dance is usually performed for welcoming the guests (welcoming dance). The dance is inspired by the "Cili" ornament. Cili is a typical ornament, a long cloth with a pointed tip, complete with beautiful golden ornaments and motifs. This cili is worn as lamak, a piece of cloth hanging from the chest. In the Balinese dance performances, the costume and makeup play an important role. It represents the particular characters portrayed in the dance. Cilinaya dancers wear "ankin", a short cloth with golden motif to covering the dancer's torso. Meanwhile, the lower half of the dancer body is wrapped with motif cloths, which extends to the ankles. Cilinaya dancers use "gelungan" (a crown), equipped with "gonjer" and red flowers on the back. The dancers' hair is arranged in such a way, hanging, and the tip of the hair extends to the lower half of the body. In addition, some other ornaments are also worn such as: badong, tutup dada (chest cover), lamak (cili), gelang kana (wrist and arm bands), and ampok-ampok (carved leather belt).